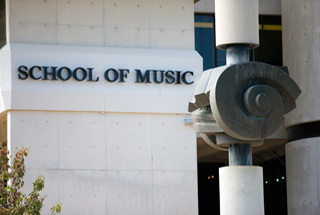 Situated in the heart of the nation’s capital, and on the campus of Australia’s foremost research university, the Australian National University School of Music has a proud and rich history. It was the first purpose-built music school facility in Australia and for nearly 50 years the School has also played a leading role in the cultural life of Canberra and our region. Today, the School delivers a model of music education which best supports the vocational and professional needs of music students grounded in a vision of public service. It engages positively with the fact that globalisation and the rise of the digital age are having a profound impact on musical culture in Australia, while reaffirming the profound human truth that the most immediate and powerful way we experience music remains through the act of performance. At its heart, the School affirms an ideal of musical excellence that is ethically informed, generous of spirit, intellectually rigorous, outward-looking, responsible, accountable, and receptive to new ideas. • Builds on the vision of the School of Music’s founding director, Ernest Llewellyn, to promote creative life on campus and in the community, and attract Australia’s most gifted students in the pursuit of the highest educational standards. • Nurtures high-calibre teaching staff who can enlighten and inspire students to reach their full potential through academic excellence and personal growth. • Prepares students for successful careers as music professionals. • Leads the discipline of music education in response to the effects of globalisation and the digital age on Australian musical culture, through innovative course development, interdisciplinary exchange, and engagement in local and national debates. • Inspires graduates to become outstanding contributors to the local, national, and global community as musically informed and empowered citizens and leaders.